If you select this delivery option, The Gas House will automatically schedule deliveries to your tank based on projected usage and/or past history.We are responsible for making sure that there is adequate propane supply in the customer's tank at all times. 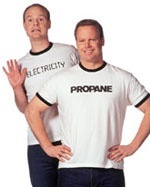 This option is for those customers who want to manage their own propane supplies. It makes it the customer's responsibility to monitor the tank and call in when they need a delivery. Call should be made when %gauge reads 25%. Will Call customers will receive a delivery on a best efforts basis and normally within 5 business days from the date of their call. Cash on Delivery. Needless to say, most customers find this method inconvenient. So do we. We bill you for the gas that is delivered, providing you qualify for an open account with our company. You pre-pay for your gas at one of our offices, then we will schedule your delivery. We understand that unexpected events can occasionally place our customers in unintended financial circumstances. Should you find yourself unable to maintain your account in "current" status please contact us as soon as possible. We will work with you in setting up a DEFERRED PAYMENT AGREEMENT to keep your service from being interrupted. To reach our 24 hour emergency service, call: 440-439-4474 and follow the instructions. Dr. Walter Snelling, directing a series of experiments for the U.S. Bureau of Mines, he discovered that several evaporating gases could be changed into liquids and stored at moderate pressure. The most plentiful of these gases was propane. Dr. Snelling developed a way to "bottle" the wet (liquid) gas. One year later, the commercial propane industry began heating American homes. If a Will Call customer does run out of gas, emergency service is available at an extra charge. As mandated by our insurance company, we will have to do a presure test of the system and re-light any pilots. A service charge will be added to the cost.